The original Speed Twin, first released in 1938, was a benchmark for the British motorcycle industry. But when Triumph’s factory in Coventry was wiped out in World War II, it was the Speed Twin that the kept the company alive. Now, for the first time since it was retired in 1966, Triumph is making a Speed Twin again. There is something odd about the looks. The stripe on the tank being angled down makes it look like the tank is not properly seated down at the back. I think the angle would look better with an 18 or 19" front wheel. 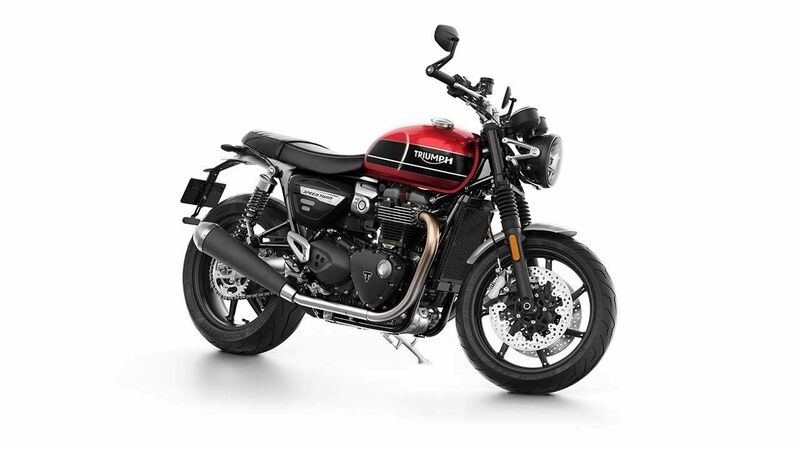 I prefer the overall look to the Bonnie and I hope it's more exciting to ride than the 1200 Bonnie but I could not live with that tank stripe. I also notice Triumph have finally given up on the faux carbs. I like it - it sits nicely between the Thruxton and T120 models. I suspect its biggest market will be the US. I wonder whether there'll be an "R" model with an upside-down front fork and better spec Öhlins rear shock absorbers. Should be more exciting than the Bonnie -- 97 bhp, 112 Nm. I like the look of it a lot. But I'd like it better if they put proper mudguards on it. This Speed Twin is, imo, what the Bonnie should have been back in 2001. The roadburner the original was back in its day. Sooner have had an RGS though. Yeah, completely agree, I absolutely loved my 2001 bonnie, but until I'd sorted out the handling and put Norman Hyde pipes and a dynojet kit on it it felt like a superdream - not terrible because the superdream was a pretty nice bike, but then again not exactly inspiring. They eventually did turn out to be a top seller as far as I know, but it took a capacity increase. I think they mistakenly presumed people would swap the standard pipes out, but especially at the time (18 years ago) they were selling to old nostalgia junkies who kept bikes stock. There are now so many pristine bikes around that have barely turned a wheel in 15 years it's ridiculous, if they'd been a better stock bike I'm sure they would have been ridden more. The only problem with the current range is they keep going for lower and lower seat heights on the affordable models and it makes them less and less useful to 6'3" me, as they don't offer any high seat options. So here I am, riding an XC for the legroom (and the thrills!). It's a shame the 21" wheel 1200 Scrambler is so pricey, that would fit me. We won't know what the comfort is until we sit on it. All about seat to peg for us old boys with bad hips & knees. Conceptually bang on the money but who on earth thought it was a good idea to replace those beautiful carbs with ‘torn open’ sardine tins and leave it with vestigial mudguards! I agree with the comment about the line too. Having said that, I quite fancy replacing my Multistrada with a black one of these.